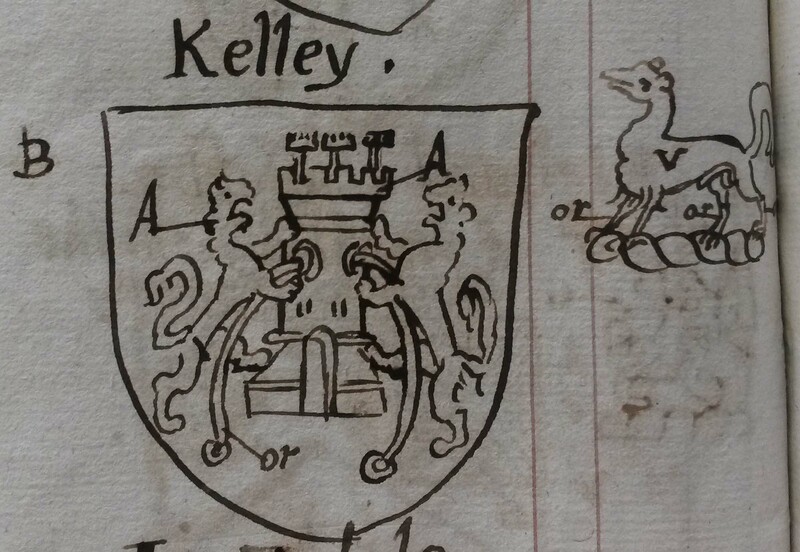 Arms of William Kelley of Dublin, who died 3rd September 1597, as depicted in G.O. Ms. 65 and who was also associated with the same arms in G.O. Ms. 64, wherein he was described as ‘barbour shirurgion’ and buried 6th of September of the same year.© National Library of Ireland. 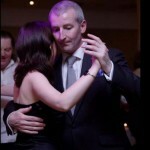 There is little surviving evidence of arms attributed to members of the O Kellys of Uí Maine dating from the sixteenth century, but this holds true for many leading families of Gaelic origin. The shield attributed to William Kelly of Dublin, however, bears distinctive compositional similarities to those used by others of Gaelic origin. As such it may suggest that the arms were in use by those of the name Kelly of Gaelic origin from about the time of this William Kelly if not earlier. Rubbing of arms from the O Kelly memorial at Cadamstown provided by Lord Walter Fitzgerald in his 1899 article published in the Journal of the County Kildare Archaeological Society and Surrounding Districts. The inscription suggested that the arms were granted or confirmed by a King of Arms named John St. George, but no King of Arms of that name existed and it was suggested by some commentators that it should have more correctly read ‘Richard St. George’. This latter individual only joined the English College of Arms in 1602. He attained the offices of Berwick Pursuivant of Arms in Ordinary and then Windsor Pursuivant of Arms in Ordinary before being appointed Norroy King of Arms in 1604. 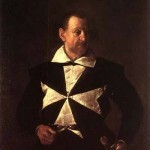 He would later be knighted and attain the office of Clarenceux King of Arms but never held the office of Ulster King of Arms who dealt specifically with Ireland. Daniel Molyneux served as Ulster King of Arms in 1603, holding that office between 1597 and 1629. 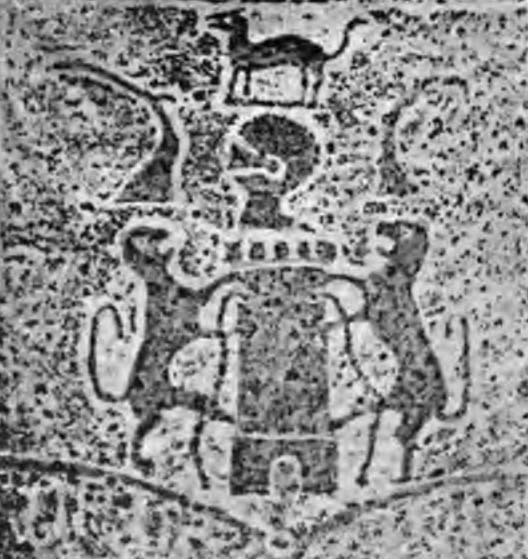 Lord Walter Fitzgerald, who reported on the Cadamstown slab in the Journal of the County Kildare Archaeological Society in 1899 and included a rubbing of the arms therein, contacted the office of the Ulster King of Arms in relation to the reference to a King of Arms. Sir Arthur Vicars, Ulster King of Arms from 1893 to 1908, responded to Fitzgerald, informing him that ‘neither in his office nor in the Herald’s office in London, have they a record of this grant’ but suggested the King of Arms in question may have been Sir Richard St. George, Knt., who was Clarenceux King of Arms from 1623 until his death in 1635. It is unclear when the O Kellys of Uí Maine first adopted the use of the arms involving two lions either side of a triple turretted tower. 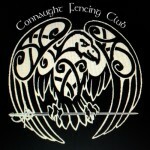 Two lions combatant was a design feature common to many Gaelic arms across Ireland, such as O Neill, O Carroll, O Reilly, O Meagher, O Shaughnessy, O Kilkelly and others. Given the association of this design with William Kelly of Dublin in 1597 it is likely that these arms may have been associated with the O Kellys of Gaelic origin before this date, as its design is closely akin to Gaelic rather than English arms. 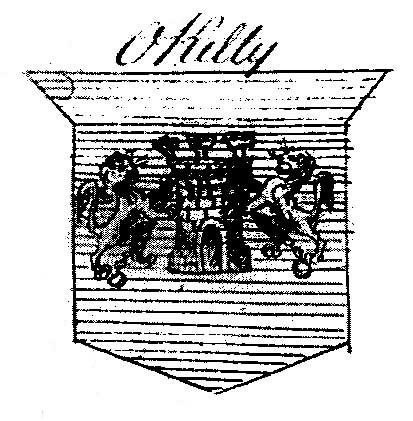 The arms of associated with a family of the name Kelley, as shown tricked in Genealogical Office Manuscript Number 61, which once formed part of the records of the Ulster King of Arms. The manuscript is thought to date from circa 1665 but it is unclear to which family of the surname Kelley or Kelly this particular record relates. The crest in this case shows the enfield Vert with legs tinctured Or. © National Library of Ireland. 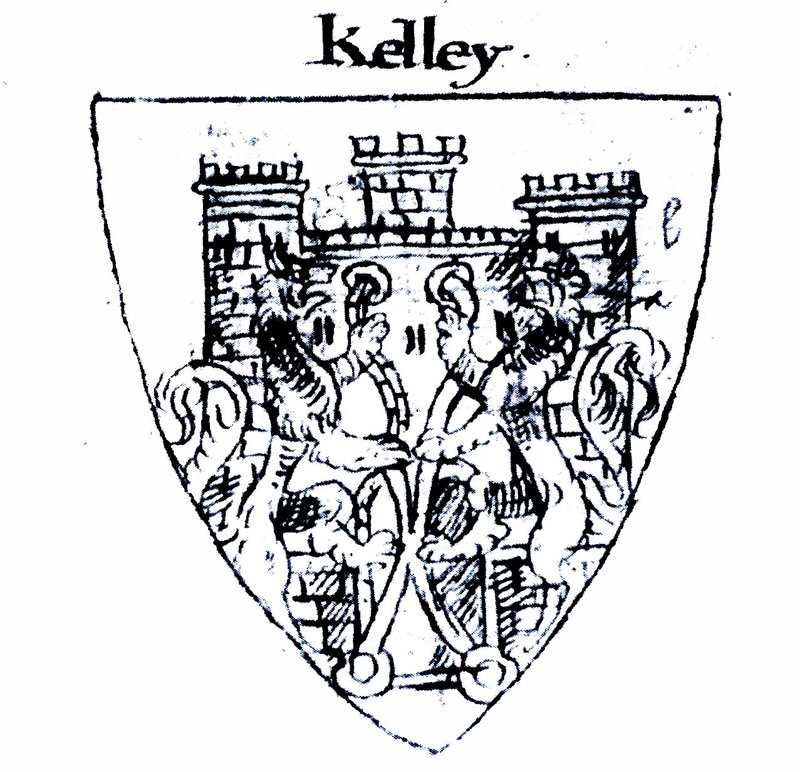 The similarity of composition does not appear to have been intended to reflect any ancient genealogical link between those families of a name other than Kelly and the Kellys and may only indicate a similar approach to shield design using common design elements. 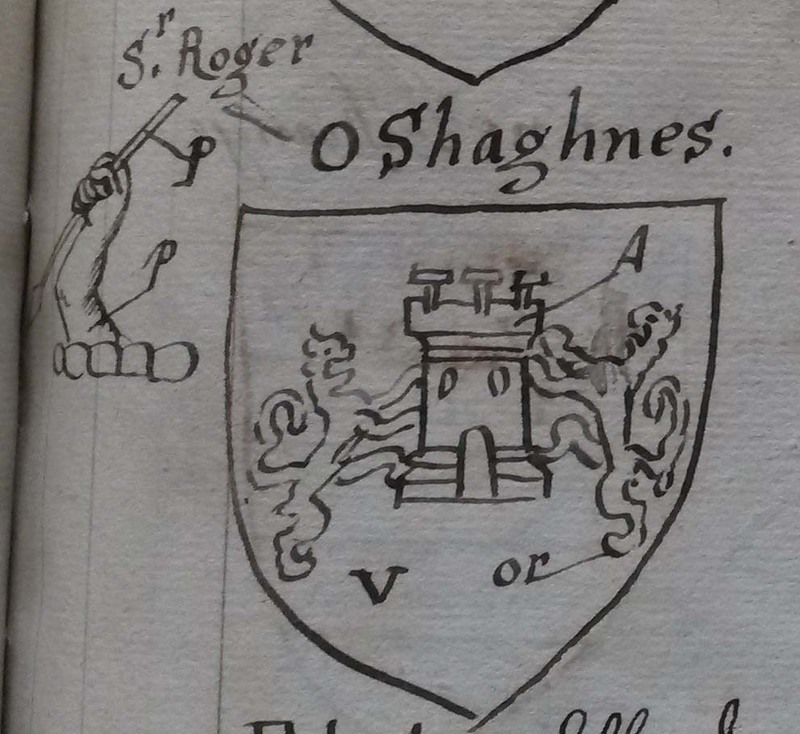 The arms of Sir Roger O Shaughnessy as sketched in G.O. Ms. No. 61, a collection of Tricks of Arms of Irish and English families, believed to possibly date from circa 1665. © National Library of Ireland. 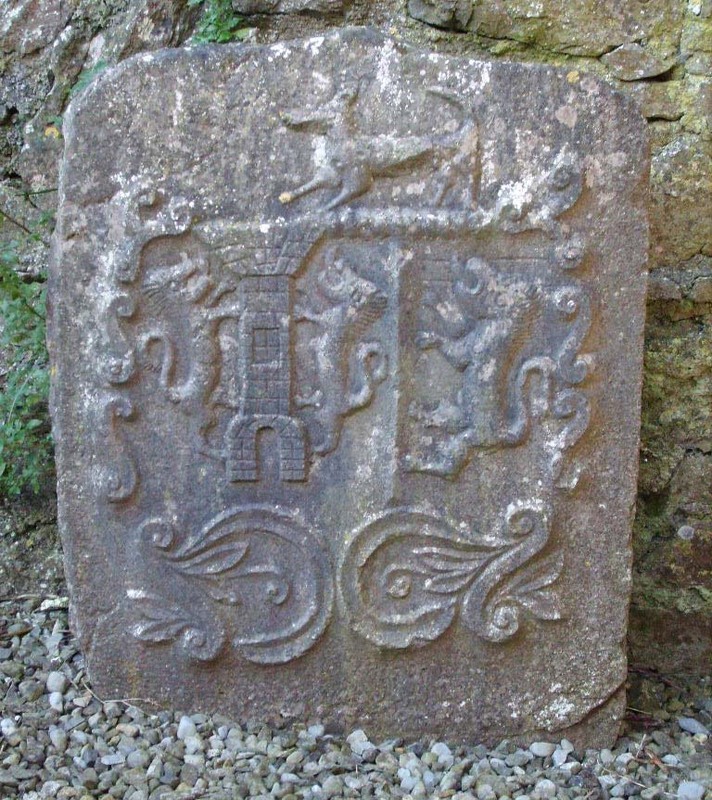 It is possible that the earliest surviving physical example of the arms of an O Kelly in the east of County Galway occurs on an armorial stone at Kilconnell Abbey. 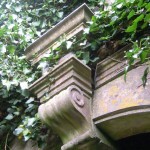 The crudely-carved stone commemorates an armiger of the Kelly family and stands against the southern wall in the grounds of the choir of the abbey. The elements of the composition stand in high relief from the stone itself with no clear outline of a shield other than that suggested by a scroll-like decorative element extending down from the crest to the base of what is intended as the shield. The arms given here are impaled arms, with a clear strong vertical line in relief dividing the dexter and sinister sides, the Kelly arms given on the dexter side. The arms of the armiger’s wife’s family is depicted on the sinister side, dominated by a lion rampant over what are a pair of barely-discernible incised horizontal lines in chief behind. 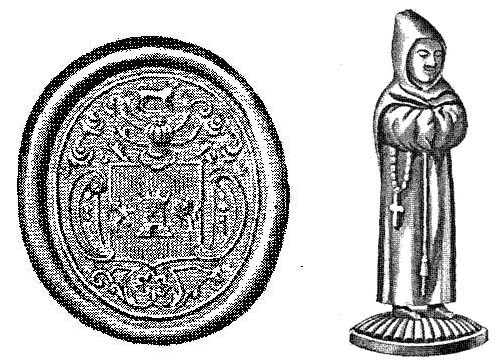 Although the arms are primitively depicted, the stone would appear to date from the mid eighteenth century, considerably later than arms are likely to have been in use by senior members of the name descended of the Uí Maine. No inscription was provided on this stone but Rev. R.S. 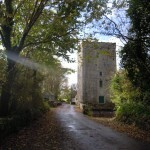 Maffett visited the abbey at Kilconnell in the late nineteenth century and noted in 1892 an inscription on a flat stone at the foot of the armorial stone; ‘IHS, Pray for ye Soul of Bryan Kelly of Grigan who died ye 17 of 8 Anno Domini 1751. This stone was erected by his wife Susan na Kelly alias Moore.’ It would appear likely that the armorial stone may be that of this Bryan Kelly with the arms on the sinister side a primitive representation of the Moore arms, the incised twin horizontal lines behind the lion’s head intended to represent the bars Sable of the Moores. The presence of the lion would suggest that this branch of the Moores, likely to descend from John Moore of Cloghan Castle, Balla and Brize, bore the lion rampant Gules charge. The impaled arms of a Kelly armiger at Kilconnell Abbey, which appears to relate to one Bryan Kelly of Grigan and his wife Susan na Kelly alias Moore. (Vigors, Col. P.D., French, Rev. J.F.M. (eds. ), Journal of the Association for the Preservation of the Memorials of the Dead, Ireland, 1892, Vol. II, No. I, pp. 120-121.) Although crudely carved, the treatment of the lions rampant is similar to that employed in a number of other carved armorial stones of east Galway dating from the eighteenth century, such as that of a Lorcan armiger at Meelick and that of an Eyre at Cloonkea in the parish of Clonfert. 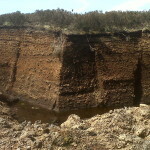 A seal matrix bearing arms that appear to be those used by various O Kellys was uncovered twelve feet below ground level in a bog one mile west of Ballinasloe in East Galway in 1858. The matrix, cast in bronze, forms the under-surface to a base of a male figure, arms folded, attired as a monk or friar, the figure serving as the stamp-handle to the seal. 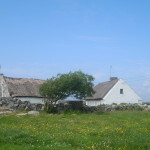 It has been suggested, given the figure forming the handle that it may have been associated with one Tadhg coach ‘blind’ O Kelly, who served as chieftain of Uí Maine or Hy Many from 1469 and who was buried in the habit of the Franciscans. Given the elaborate decorative nature of the armorial bearings and style of knight’s helmet depicted, however, it is more likely that the seal may significantly post-date the lifetime of this Tadhg O Kelly. Seal discovered in 1858, from ‘The Journal of the Galway Archaeological and Historical Society’, Vol. 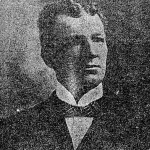 I, 1901. The seal’s armorial bearings show a shield composed of a tower supported by two lions, one on either side. As indicated on an early twentieth century illustration of the seal, the helm shown above the shield appears as a barrier helm with mantling extending thereabout and above the helm, a small standing dog-like animal with tail raised. [xii] The style of helmet, combined with the style of mantle, however, would suggest a much later date than that of Tadhg O Kelly, possibly about the seventeenth or eighteenth century. Arms associated with an O Kelly pedigree in N.L.I. Genealogical Office Ms. 146, a nineteenth century copy of an early eighteenth century work. Enfield crest associated with an O Kelly pedigree in N.L.I. Genealogical Office Ms. 146, dating from the eighteenth century. [i] NLI, Dublin, G.O., Ms. 64 Funeral Entries, Vol. 1, 1588-1617, p.16; NLI, Dublin, G.O., Ms. 65 Funeral Entries, Vol. 2, 1597-1603, p.6. [ii] Atkinson, E.G. (ed. ), Calendar of State Papers relating to Ireland of the reign of Elizabeth, 1 November 1600-31 July 1601, London, Mackie & Co. Ltd., 1905, p. 241. [iv] Calendar of Fiants Queen Elizabeth I, The thirteenth Report of the Deputy Keeper of the Public Records in Ireland, 12 March 1881, Dublin, A. Thom & Co., 1881, Appendix, p. 144, no. 3747, Lease of 1581 (under Queen’s letter 10 August xxi) to Wm. Kelly, surgeon; of the manor of Ratouthe, Co. Meath, Heinotes lands and other demesne lands there and land called the Maudlens, parcel of the manor. The Rectory of Palmerston, Co. Dublin, with the tithes in Palmeston and Irisheton, possessions of the hospital of St. John Baptist without the Newgate, Dublin. 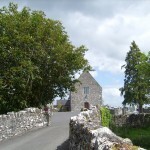 The Tithes of corn and hay of Ballihack, parcel of the rectory of Ratouthe, Co. Meath, parcel of the possessions of the monastery of S. Thomas the martyr, Dublin. A garden and shop in S. Francis Street in the suburbs of Dublin, possessions of the said hospital of S. John. To hold for 30 years from the determination of the existing leases. 10 Sept. xxiii. [v] Cunningham, B. (ed. ), Calendar of State Papers of Ireland, Tudor Period 1566-1567, revised edition, Dublin, I.M.C., 2009, pp. 251-254. No. 595. [vii] Miscellanea, Journal of the County Kildare Archaeological Society and Surrounding Districts, Vol. II, No. 7, Dublin, Edward Ponsonby, 1899, pp. 448-451; Journal of the Association for the Preservation of the Memorials of the Dead, Ireland, Vol. III, Part II, 1895-1897, Dublin, Peter Roe, 1898, p. 291. In 1895 Lord Walter Fitzgerald first suggested the crest to have been a lion but in 1899 in the County Kildare Archaeological Society Journal gave the crest as an enfield. [ix] Pender, S., The O Clery Book of Genealogies: 23 D 17 (R.I.A. ), Analecta Hibernica, No. 18, 1951, pp. 113-4. [x] Pender, S., The O Clery Book of Genealogies: 23 D 17 (R.I.A. ), Analecta Hibernica, No. 18, 1951, pp. 113-4, 117. [xii] Biggar, F. J., The Franciscan Friary of Kilconnell in County Galway, J.G.A.H.S., 1901, Vol. I, no. 1, p. 157. [xiii] N.L.I., Dublin, G.O., Ms. 146, Linea Antiqua II (Betham), p. 204, 205. 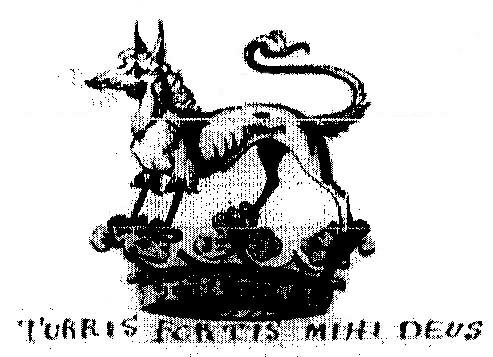 M. Ó Comáin in his book ‘The Poolbeg Book of Irish heraldry’, Dublin 1991, p. 83, gives an enfield as having the head of a fox, the chest of a greyhound, the front legs shown as the legs of an eagle, the body of a lion, rear legs and tail of a wolf. [xiv] O Donovan, J., Tribes and Customs of Hy Many, commonly called O Kelly’s Country, Irish Archaeological Society, Dublin, 1843, p. 98.